It's hard to believe that after all the years that Nintendo's been around, they've never had an ad play during the Super Bowl. Well that's about to change as this year Nintendo will run an ad during the big game for the first time ever. The thirty second ad, which also has an extended ninety second version which can be seen below from their YouTube channel, will focus on the excitement of the upcoming Nintendo Switch and The Legend of Zelda: Breath of the Wild. The ad also features "Believer", a new song by Imagine Dragons that premiered worldwide on January 31st. REDMOND, Wash.--(BUSINESS WIRE)-- For the first time ever, Nintendo will run an ad during the Super Bowl. 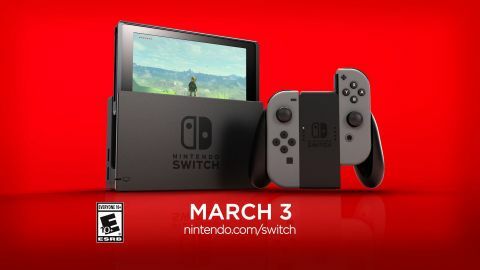 The 30-second spot, which along with an extended 90-second version can be viewed at http://www.youtube.com/nintendo, builds on the worldwide excitement for the new Nintendo Switch video game system and The Legend of Zelda: Breath of the Wild game, both of which launch March 3. The ad also features a new song by Imagine Dragons called “Believer” that premiered worldwide Jan. 31. The soundtrack to Nintendo’s ad, “Believer” by Imagine Dragons, is available now on iTunes, Apple Music, Google Play, Amazon mp3 and Spotify, and is part of an upcoming new album from the band. This is not the first collaboration between Nintendo and Imagine Dragons, whose members are longtime fans of the video game company and The Legend of Zeldafranchise. At The Game Awards in 2014, the band closed the show by performing a medley of music from The Legend of Zelda: Majora’s Mask with veteran Nintendo composer Koji Kondo.